Another 4:30 am wake up call and we are off the docks at 5:30. Rhapsody, a 55 foot Nordhavn, and Sunchaser V , a 50 foot Defever, are just ahead of us. The weather forecast is still calling for gale force winds ( 30-40 knots) starting late morning and continuing for the next two days. We have one section of exposed waterway before turning into Reed passage. We hope to get that behind us before the big winds arrive. This is a tricky section through a series of reefs and the guide book warns that waves can crash over them making passage perilous during conditions of high winds and seas. If it is too bad there we will turn around and find another anchorage. It is a grey rainy day but the winds haven’t reared their ugly head yet. We have only a light chop out in Seaforth Channel. The swells increase as we near Milbank Sound. Reaching our turn at Reed Passage, we are happy to find just a slight swell and a following sea. It looks like our early departure was worth it. Our decision now is what to do at Percivell Narrows. By leaving early this morning, we are arriving at these Narrows during a maximum flood of five knots. We could anchor and wait for slack at Oliver Cove. We have building winds forecast for later in the day. Sunchaser has done this trip five times and feels these Narrows do not pose a problem with the flood tide. We follow their lead and have an uneventful ride through the swift current. 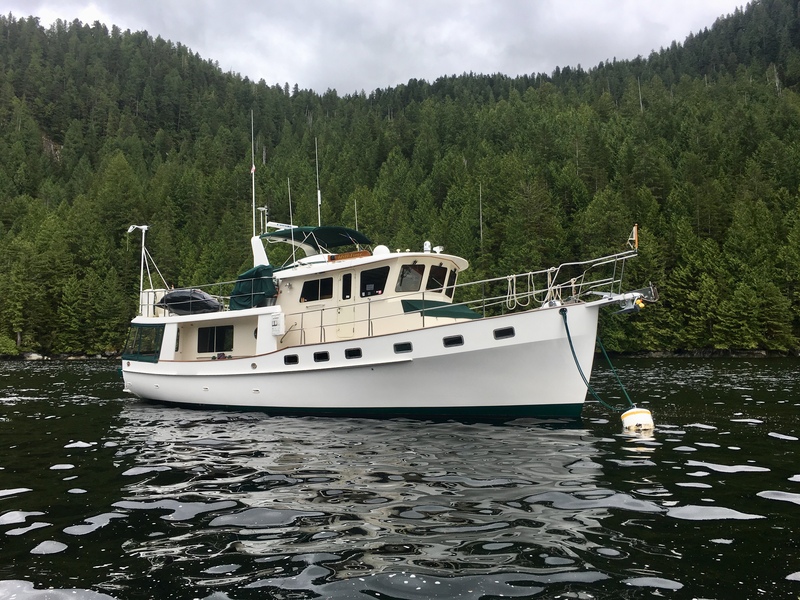 We continue another twenty miles up Finlayson Channel to our anchorage at Bottleneck Cove. On our way we spot two whales and several dolphins play in our bow wake. Sorry, no pictures as it was too cold and rainy outside. Bottleneck Cove our anchorage for the next two days is an excellent place to wait out the thirty knot winds. We have this beautiful wilderness anchorage all to ourselves. For the next forty eight hours it rains continuously. 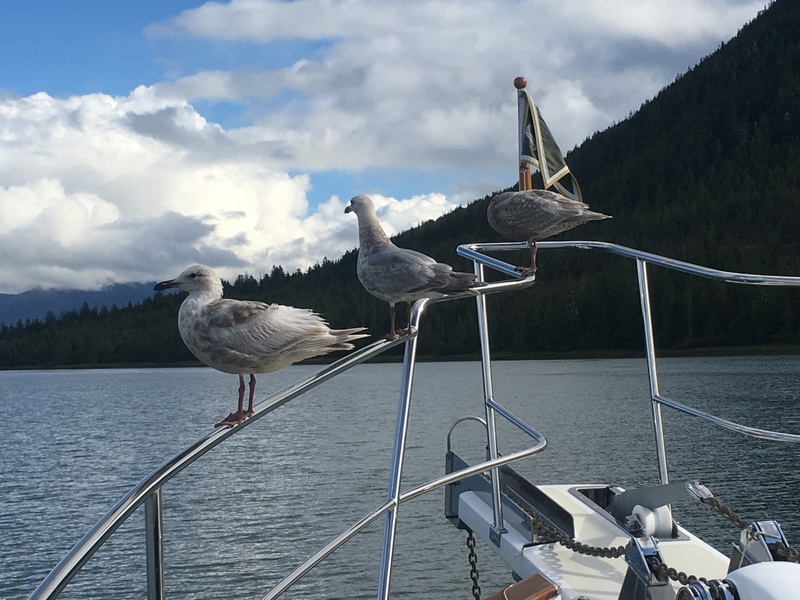 A day of rest is just what we needed to regroup before crossing Dixon Entrance into Alaska. This gives us time to study the maze of upcoming channels, coves, and passages and plan our next leg of the journey. Puff, our diesel heater, does a great job of keeping us warm and dry inside. 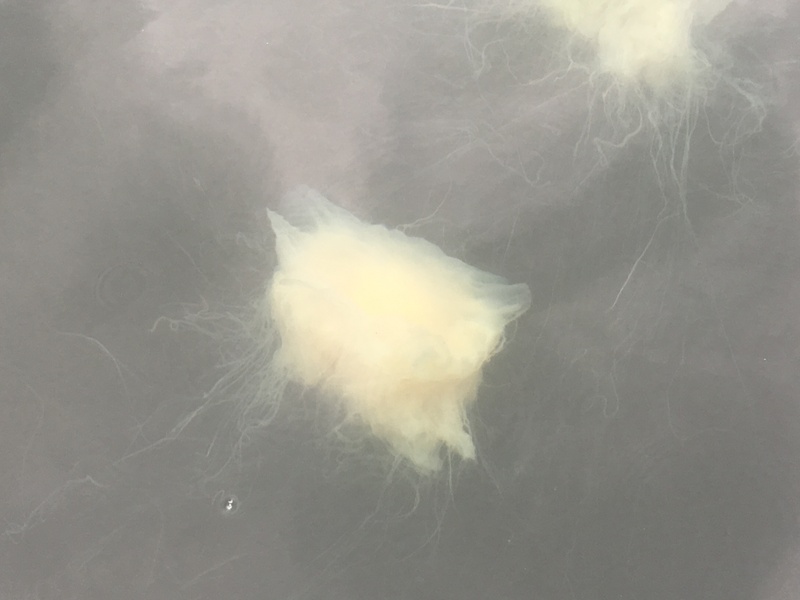 We see some hugh jellyfish just below the surface while putting out our crab traps. 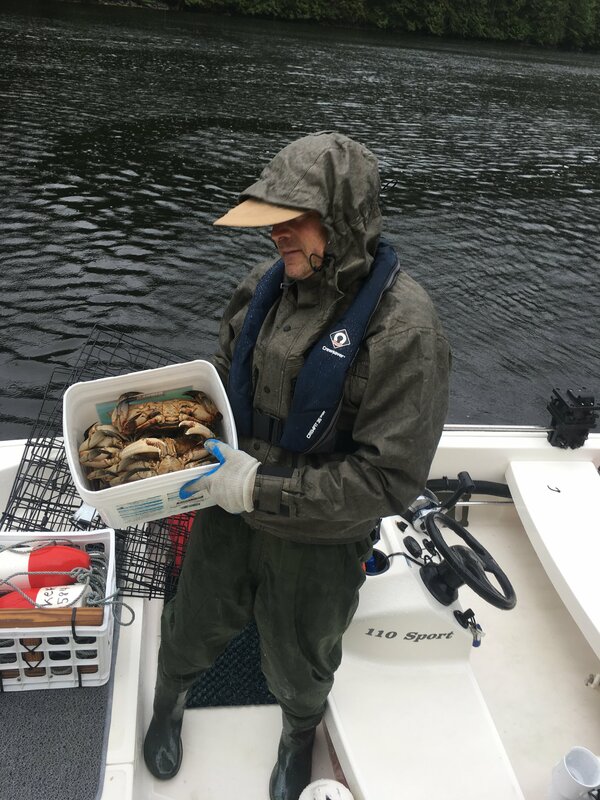 After letting the traps sit overnight we are rewarded with eight male Dungeness crabs. It makes braving the wind and rain worth the effort. After steaming and picking the crabs we ended up with three pounds of crab meat. The crew will eat good for the next few days. Tomorrow will be another early start as we need to transit Heckish Narrows at slack tide. The front came through during the night and brought with it some strong winds. Jeff and I were both up in the pilot house for several hours making sure the anchor didn’t drag. We never budged an inch. The winds funnel through these tall mountains in strange directions. By dawn the rain has dissipated and the cloud cover is beginning to break. We are on our way at 5:30 am in order to reach Hiekish Narrows at slack tide. We weren’t sure what to expect at these narrows as our two primary tide guides differ on when slack will occur. Using the average of the two times, our transit was completely uneventful with only one knot of current. Our travel along Graham Reach is quite picturesque with many foaming white waterfalls cascading through the dark green forested mountains. Other than the passing tug “Island Explorer” with two huge barges in tow, we are all alone as we weave through this maze of waterways. Several White Sided Pacific dolphins keep us entertained as they play in our bow wake. 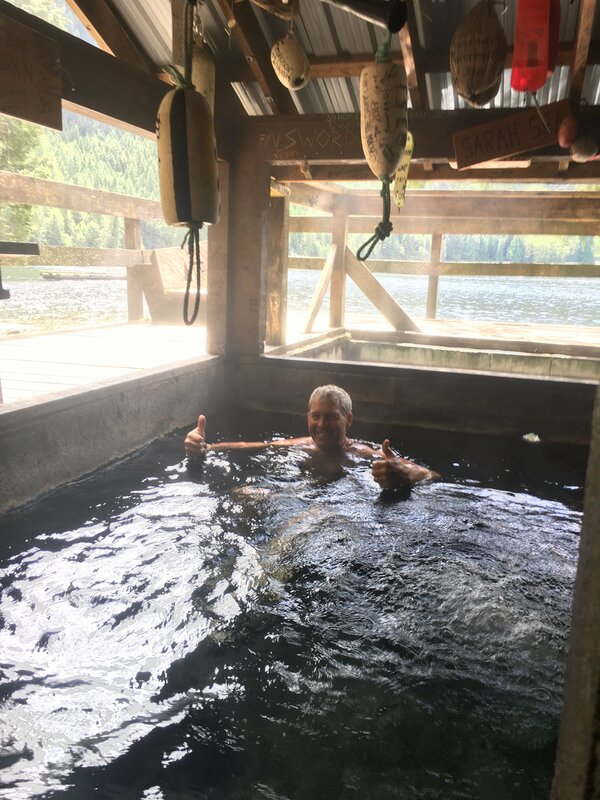 We take a detour off the Inside Passage route and head up Ursula Channel to Bishop Bay Hot Springs. 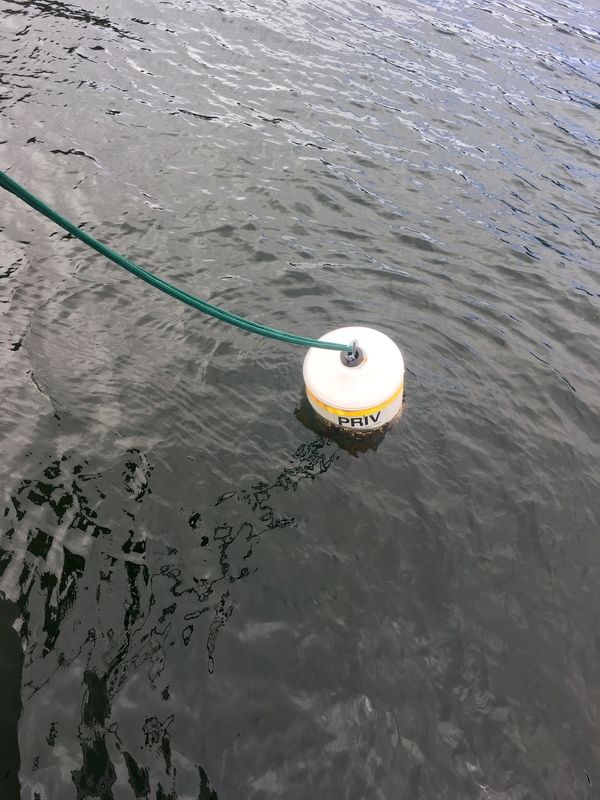 At the head of the Inlet we are happy to find the three mooring buoys empty. It is too deep (120 feet plus) to have a secure anchorage here. Ashore are some natural hot springs. Years ago a cement bathhouse was built against the cliff and the hot springs are channeled into the concrete basin. Boaters have been coming to this rural outpost for years. It is now managed by B.C. Parks in collaboration with a local First Nation tribe. This is a very remote area only assessable by boat or plane. We have the springs all to ourselves and enjoy the nice hot crystal clear bath. Just as we are leaving, a fishing boat pulls into the dock. 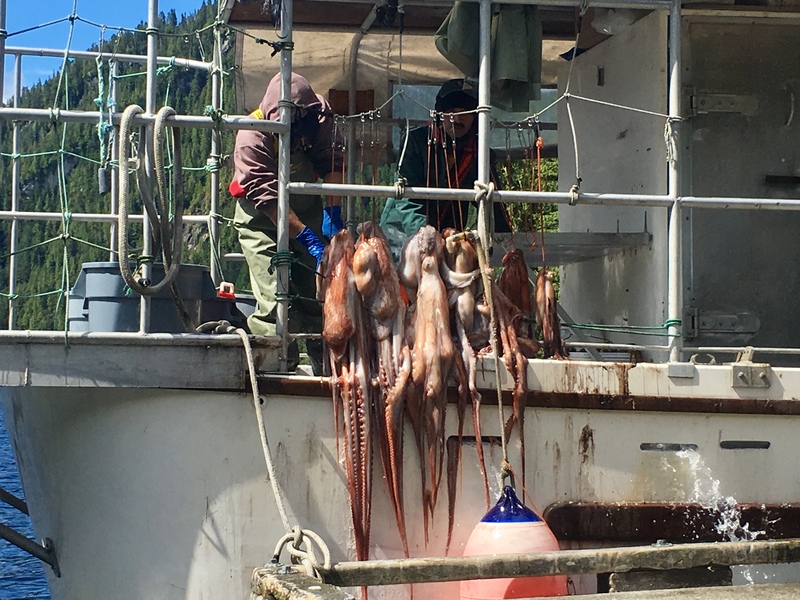 Hanging off their stern rail are about eight recently caught octopus. After cleaning their catch, they head up to the hot springs. I am glad we arrived early and got to enjoy our initial hot spring soak in seclusion. After setting a shrimp trap, we enjoy the evening watching several Bald Eagles as they rotate in the twilight blue sky over our head. It is a peaceful night at anchor. It’s a chilly 50 degrees out this morning as we release Idyll Time’s tether from the mooring ball. 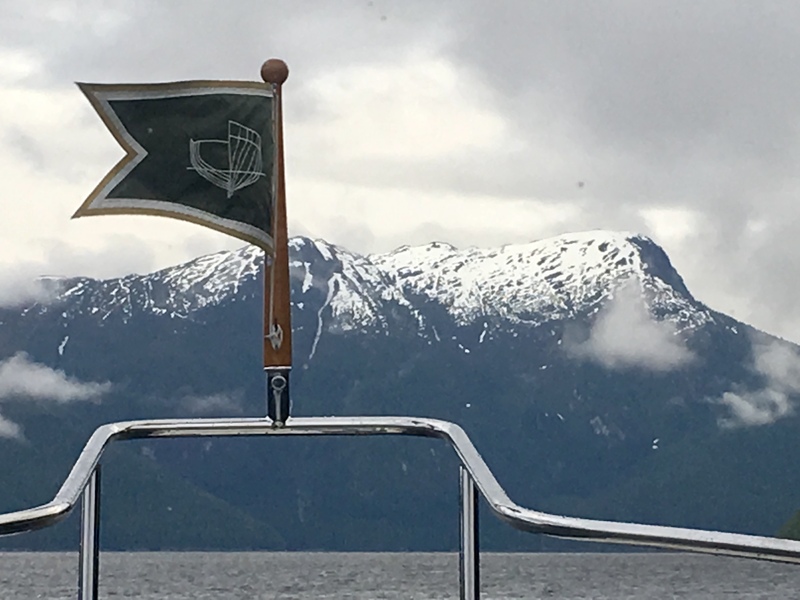 As we work our way along Ursula Channel, we marvel at the snow capped mountains as they rise higher and higher from the water. We enter the Grenville Channel at 9:30 am. A large humpback sounds just in front of us. Our timing worked out well today as we are entering this 45 mile long narrow waterway just as it begins to flood. An ebb current on this section would have up to five knots of current against us. Flood currents on this waterway switch half way through. At the south entrance flood sets north while at the north entrance flood sets south. 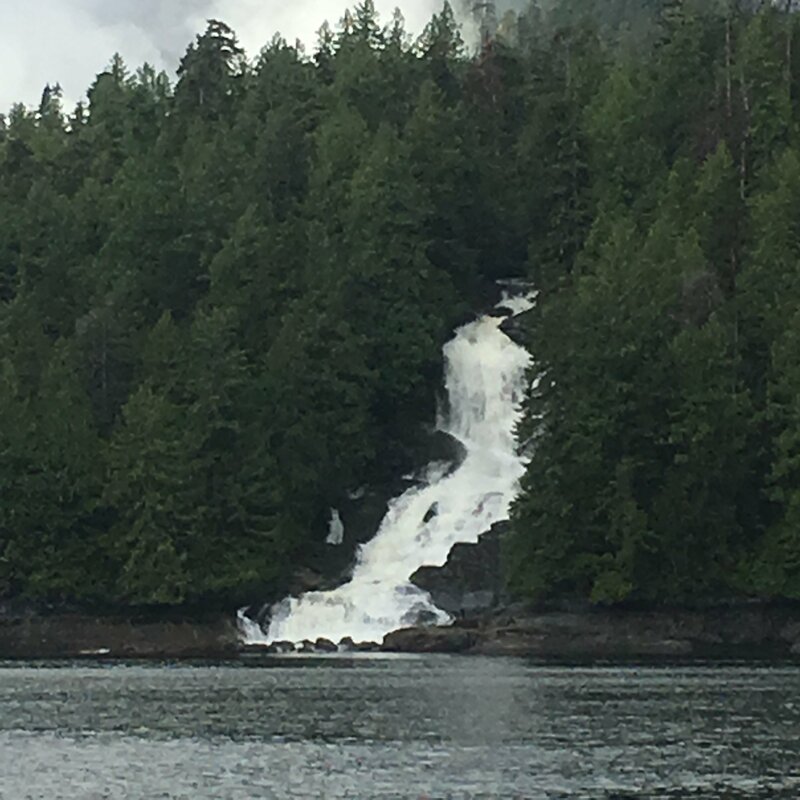 We must continually monitor our AIS and also Prince Rupert traffic on VHF 11 as all boats including cruise ships and Alaska State Ferries us this narrow passage as they go north or south. The rain returns and we have limited visibility. There is supposedly some dramatic scenery along this passage but today we can barely see 100 yards in front of the boat due to dense fog. Luckily, there is little to no traffic. 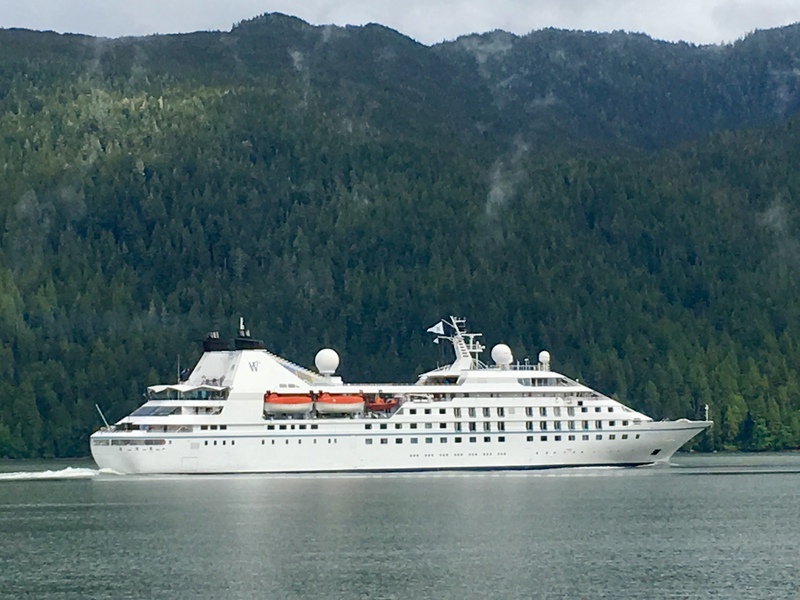 Just as we exit Grenville Channel and are making our way to our anchorage at Kelp Passage, the Cruise ship Star Legend passes by. We are now only 13 miles south of Prince Rupert. Our original plan was to dock in Prince Rupert but there is a flotilla of 15 boats there today. We last saw this group in Port McNeil and have been trying to stay out of their way. We will save Prince Rupert for our return trip. The weather forecast looks perfect for crossing Dixon Entrance tomorrow. This is another open water passage of about 40 Miles for which we will need good weather. It’s early to bed for a 4 am wake up call. This entry was posted on June 7, 2018 at 4:40 am. You can follow any responses to this entry through the RSS 2.0 feed. You can leave a response, or trackback from your own site. 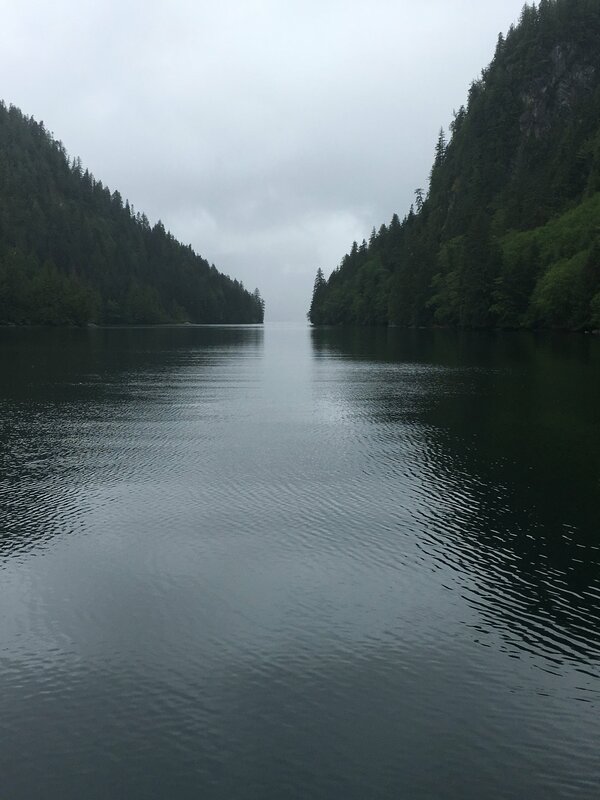 1 Response to "Inside Passage to Alaska: Part three"
Ahoy friends! Just reading your blog and enjoying your pics of Ketchikan as I had a few native Alaskan students a few years back who are from this town. The scenery is breathtaking even in the pics. Enjoy and be safe~always? ?